With deepest sorrow, we share that Thomas Martin Grill, age 18, of Cedar Lake, Indiana, our beloved son, brother, family member, and friend passed away on February 25, 2019. Those who knew Thomas, even just a little, lost a shining light in their lives. Thomas will be missed every day by his beloved family, his father Tom Grill, his mother Patty Grill, his brothers Rudy, Daniel, and Charlie, his sister Suzie, grandparents Keith and Sharon Grill, grandmother Carol Cain, as well as his loving aunts, uncles, cousins, and great friends. We know Thomas is now with his grandfather, Martin J. Cain, Jr, great grandmother, Monica Kreten, and is loved here on earth as well as in heaven. We love and miss you so much Thomas! Funeral arrangements have been entrusted to Fagen-Miller Funeral Home 8580 Wicker Avenue in St John, Indiana. Visitation will be on Sunday March 17, 2019 from 2:00 until 8:00 pm at Fagen-Miller. Thomas' funeral Mass will be held at later date. 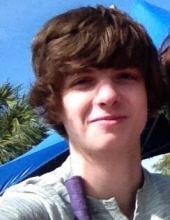 Thomas was an extremely intelligent, independent and loving young man. He was full of ideas and the wheels in his brain were constantly turning. The excitement and passion in his face and voice were ever present when talking about his newest ideas. He knew something about everything. He was our "go-to-guy." He had such a bright future ahead of him and had so many plans for that future. Thomas is loved by so many and will forever be remembered as the beautiful son, brother, grandson, nephew, cousin, and friend that he was. His friends say "when no one believed in you, Thomas would be the one and only person who did. He was always there for his family and friends. He was right there to ride with you through whatever." Our family asks that if you are ever in California, please say hello to Thomas. He called California his happy place. We would love to have everyone cherish his life there. Thomas said"California showed me that to find true happiness you have to look within yourself and find out what you want and how you are going to get there." We love how genuinely happy you look in this picture, Thomas. We love you and will hold you in our hearts forever, our angel. Miss you always. In lieu of flowers, our family asks that donations be made to the Make-A-Wish Foundation to give other people the opportunity to visit their "happy place."